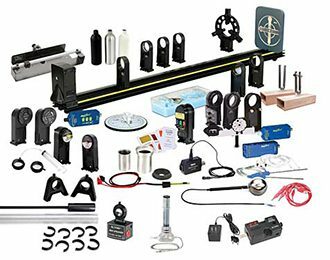 The complete Waves, Optics, and Thermodynamics bundle of sensors and equipment designed for use with Comprehensive 850 Physics System Experiment Manual. Allows student groups to complete 22 classic physics experiments. This unique calorimeter uses a heating resistor instead of a spring coil to heat a small amount of water. Includes two slit wheels allowing students to examine various diffraction patterns. Includes +200, +100 mm lenses. Each lens is mounted in a lens holder for protection and easy storage. A double-sided mirror, concave on one side and convex on the other, and a semicircular half-screen. Both are mounted in a holder for easy placement on the Basic Optics Track. Designed to be used with Basic Optics System allowing students to explore interference patterns. Project images onto this white plastic screen, which is used with Basic Optics systems. A rotating disk with a polar grid that provides an excellent surface for measuring incident, reflected, and or refracted light rays. An all-in-one bright point source, illuminated crossed-arrow object, primary-color source, and ray box with up to five parallel rays. Allows unmounted lenses and mirrors to be used with other optics equipment such as the Beginning Optics System. An accessory for to the basic optics system to demonstrate additive color mixing. The 1.2 m optics bench is a perfect length for investigations involving lenses, mirrors, and diffraction/interference patterns. Made of rugged extruded aluminum. A basic set of lenses and mirrors for ray and color experiments. Includes +250 mm and -150 mm lenses. Each is mounted in a lens holder, which clips directly into the Basic Optics Bench. Measures relationship between light intensity transmitted through set of polarizers and angle of the polarizers. Used with the Rotary Motion Sensor and provides position data to the computer. Can be attached to Basic Optics Bench. Measures gas pressure from various sources and internal vacuum allows consistent measurement above and below ambient conditions. For use with PASPORT Interfaces. Allows any combination of our stainless steel, fast response or skin/surface temperature probes for a wide variety of temperature measurement. For use with PASPORT Interfaces. Designed to perform visible light studies from low intensity spectral studies to daylight. For use with PASPORT Interfaces. These boxes are constructed from hardwood and feature an A4 tuning fork mounted directly to the box. If tuned to the same frequency, striking one will cause the other to go into sympathetic vibration. These heavy, insulated patch cords are convenient, durable and inexpensive. The grips are stackable and made of soft plastic for flexible strain relief. The spring connectors rotate in the grips, reducing wear due to friction. Length of 75 cm, set of 5. Three cans in different colors to quantitatively investigating a full range of heat transfer phenomena. Two nested cardboard tubes allow students to vary the length of a column of air and study resonance in both open and closed tubes. Drives a string or elastic cord to produce a standing wave. Use it to study frequency, wavelength, and resonance. It’s well-suited for demos and hands-on experiments. Designed for the study of wave properties, features a high-quality woofer mounted on a sturdy base with standard banana jack inputs.